Atkins Building’s second Wedding Fair a sucess! Despite the cold weather on Saturday 23rd February nearly 200 people came throught the doors at Atkins Building to see the 21 local exhibitors including Hinckley & District Museum who were showcasing their garden as a Wedding Photography location. Lots of prospective couples took the Ceremony Suite Tour and entered the Prize draw to Win a Ceremony. The event was photographed by the Nuneaton News and Atkins Building. Cafe Impressions and the Atkins Building Gallery also saw plenty of footfall and business. The Winner of the Ceremony which was drawn by last year's winning bride Natalie Browne, who was married here at Atkins Building in June 2012. The next winner will be announced soon. After the sucess of the 2012 Wedding Fair which showcased the talents of local businesses working in Wedding Products and Services, the event is being repeated and is a great way to support businesses in this area. 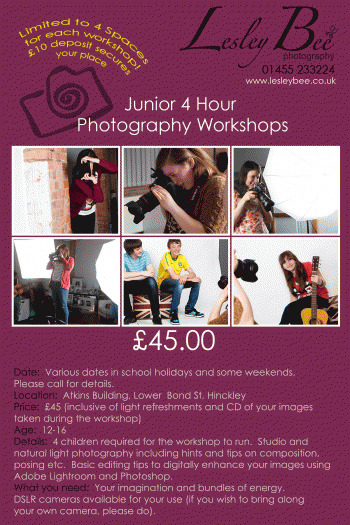 Lesley Bee is running Junior Photography sessions from her studio at Atkins Building during Feb Half Term. Budding photographers can get hints and tips on lighting and editing their photographs and recieve a CD with the shots taken on the workshop. Cost is £45 including light refreshment.